THE Land Acquisition Act 1960 and National Land Code 1965, specifically the amendment made in 1990, are two laws brought into view in the Jalan Sultan debate. 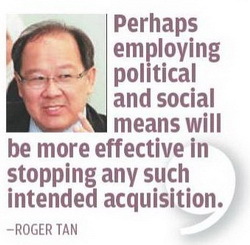 Lawyer and former member of the Bar Council Roger Tan, who is also a columnist with The Star, explained the relevance of these laws in this context. He first highlighted an individual’s constitutional right to property as enshrined in Article 13 of the Federal Constitution. The Article reads: “No person shall be deprived of property save in accordance with law” and “No law shall provide for the compulsory acquisition or use of property without adequate compensation”. He noted that even Singapore does not have a similar provision in its constitution. The word ‘law’ in Article 13(1) can only mean an enacted law. This law is the Land Acquisition Act 1960 (LAA) which is in force since Oct 13, 1960. (c) For the purpose of mining or for residential, agricultural, commercial or industrial purposes. “We should note that if the acquisition is meant to build a commercial centre to help finance the construction cost of the MRT, then it becomes an issue whether the purpose of the acquisition falls within 3(1)(a). “It is near impossible to challenge the validity of a land acquisition,” he said, adding that any challenge is only limited to the determination of the measurement of the land; the amount of compensation; the persons to whom it is payable and the apportionment of the compensation only. He also noted that since 1960, there have been few cases challenging the land acquisition’s legality and validity on the ground that the acquiring authority had acted mala fide, that is, in bad faith but almost all had failed. If the acquisition is made under 3(1)(b), the acquiring authority will need to follow the procedures detailed by 3A, 3B, 3C, 3D, 3E and 3F which were incorporated into the LAA in 1992. He explained that the main issue of acquiring under 3(1)(b) would be whether a development approval was granted and whether the acquisition was for public utility. Section 68A states even if the subsequent use of or dealing with the land might be different from the purpose which was originally stated when the land was acquired, the acquisition is still legal. Such a provision acts as an ouster clause, which means the acquisition cannot be invalidated. The National Land Code (NLC) was brought into light by some parties to highlight the possibility of acquiring only the stratum (underground land) while not affecting the surface properties. Tan said Section 44 (1)(a) of the NLC endowed upon landowners the exclusive use of (air) space above and below the land. However, ever since Part Five (A) of NLC was inserted by the NLC (Amendment) Act 1990 on 23 February 1990, separate ownership of surface land and stratum land has been made possible. “I don’t think it is correct to state that Part Five (A) NLC was inserted to allow for the acquisition of underground land without affecting surface property, which is by acquiring only the stratum. That is only possible if there are already two separate and independent surface and stratum titles issued over an alienated land,” he said. (b) because of Section 44(1)(a), the State can only alienate the acquisition of pre-war buildings underground land below the alienated land to the registered proprietor of the alienated land on the latter’s application and no one else (see Section 92D). “Hence, if no individual or separate stratum titles have been issued to the registered proprietor of the alienated land, no separate acquisition of the underground land will be possible and any acquisition will then involve the entire alienated land,” he concluded. Only the state authority, in this case the Federal Government, has the power to ‘alienate’, and only state land is capable of being ‘alienated’. Therefore, if SPAD wants to give any interest over the acquired land later alienated to them, it will only be by way of a lease of between 30 and 99 years. Naturally, this will not appeal to the landowners if they now hold the freehold titles, he said. There are three other alternatives, nevertheless. One way is for the land acquisition to proceed and the other, the current landowners to surrender their properties to the state authority. By doing either of these, the state authority can then simultaneously alienate the surface and stratum land to the current landowners and SPAD respectively. The third method is for the current landowners to apply for separate stratum titles and lease them to SPAD but this may be subject to any express terms such as any prohibition against leasing. Tan opined that the third method would not be attractive to SPAD as it might not be bankable to the MRT’s financiers, and while the second method was less time consuming than the first, the state authority was technically not required to pay compensation to the landowners when the land was surrendered to them. “But this can be done by way of a separate agreement between SPAD and the landowners for the former to pay compensation to the latter upon surrender. “The subsequent payment can also be secured by way of a bankers’ guarantee,” he said, highlighting also the higher premium facing landowners when the land is alienated back to them as MRT would boost the value. Tan also noted that the second and third methods could not be exercised if the land was under any encumbrances unless with the prior consent of such encumbrancers. The state authority’s assurance that the surface land will be alienated to them is pivotal to the landowners, he noted. He said under Section 78(3) of NLC, alienation took effect only upon registration of the titles into the landowners’ names, therefore, even a letter of approval to alienate is not binding upon the state authority and will not stand in a court of law. “However, administratively, the problem can only be ameliorated but not guaranteed by arranging the time for surrender and alienation not to lapse for too long from one to the other or if it is possible, simultaneously,” he added. In terms of legislative protection for historical building, Tan agreed that the National Heritage Act (Act 645) that came into effect on March 1, 2006, has the power to do so. It is “an Act to provide for the conservation and preservation of national heritage, natural heritage, tangible and intangible cultural heritage, underwater cultural heritage, treasure trove and for related matters”. Section 70 states that if a site has been declared national heritage, there shall be no change of ownership except by inheritance or sale with the prior approval of the commissioner. No person shall without the approval of the commissioner demolish, alter or to deal with the national heritage except in case of urgent necessity for the safety of persons or property. “As a conclusion, the National Heritage Act provides extensive preservation and conservation for heritage sites, however, the area in question, that is the Chinatown, is not designated as ‘Heritage Site’ under the Act as to date and therefore the protection cannot be extended there,” he said. But despite the above, he highlighted, neither Act 645 nor the LAA states that the state authority is not permitted to acquire such properties. “Perhaps employing political and social means will be more effective in stopping any such intended acquisition,” he added.